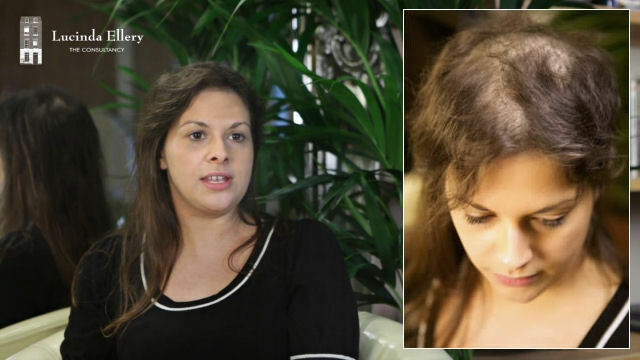 I first came across the Lucinda Ellery consultancy about four or five years ago when I was watching a documentary about Trichotillomania called Girls on the Pull. It was the first time I'd seen anyone else speak about the condition and it made me feel quite emotional in a good way to see other women talking about it and I realised I wasn't alone. And it was also great to see a place like Lucinda Ellery trying to help these women, to prevent and also to make them feel better about themselves. I really liked the idea of the Intralace System that was something that was giving them a new head of hair and was also trying to help stop them pulling with a physical barrier. And I decided to get involved with the Intralace diary project because I really wanted to help other women out to see what options are available to them, obviously seeing that documentary Girls on the Pull really helped me in realising there were other women out there with the condition, and ultimately helped me seek the help I am seeking, and obviously I wanted to use the Intralace System because it has got to the point where I've tried so many different things and when the trichotillomania is getting a bit out of control and I want to try my best - obviously there is no cure but I want to try my best to get it under control at this point and I think the Intralace System is the best way of doing it because ot only is it going to give me a full head of hair which is going to make me feel inspired and not want to go back to the place that I am in now. It’s also going to give me a physical barrier to help stop pulling so I physically can’t pull, and I think that just sounds perfect, so for me and to also help other women with this condition. Concealing the areas is incredibly difficult and time-consuming. I have to wake up extra early to kind of try and cover up; make sure that it’s not visible and sometie I can even make myself be late for work 'cause I’m spending so long trying to cover up patches, and I have used hair make-up to try and cover up bald patches. That tends to be what I do. There have been situations where I have shied away from because of my condition. I don't tend to go swimming any more, and I also put off going to the hairdresser, because as much as I can hide it from other people I can't hide it from a hairdresser because it's incredibly obvious when they're cutting the hair and I find it really embarrassing having to explain - a lot of people are very ignorant about the condition, so it tends to be something I do put off a lot. A lot of people have been incredibly understanding, and I haven't come across much stigma. I would say there is a lot of mis-conception about the condition out there. Obviously people say, “why don't you just stop pulling your hair out”, and it’s not that simple, you know obviously if I could do that I would - it’s really not that simple. I kind of liken it to wanting to scratch an itch or picking a spot - it is an urgeand when you give into that urge there is satisfaction there. And obviously it is a really horrible condition because you can see the damage you're doing to yourself but you just can't stop the urges, and I have tried to explain this to people and they are incredibly understanding but I do think it's quite difficult for them to grasp, and there is certainly a lot of stigma about it. For a long time I didn’t seek any help about the condition because I was so embarrassed and I didn’t want to admit to myself that it was a problem. I kind of told myself that it was a kind of bad habit and that it wasn't affecting my life. And then it got to the point that it really was, obviously I'd given myself this bald patch and I was taking so long to try and hide it. I was so self-conscious - I didn’t like leaving the house when it was raining or windy because I would have to always rush and find a bathroom and try and rearrange my hair. So yeah it got to the point that it was really affecting my life and I decided I had to do something about it. I have tried to conceal my hair loss with clip-in hair extensions but I don't really like them very much; I think they're a little bit obvious and they're quite impractical so they don’t make me feel particularly confident so I haven’t really used them very much. And today I'm going to have the Intralace for the first time. I’m feeling excited and nervous - probably more excited - obviously kind of wondering what the day's going to bring. I’m quite excited to have a new head of hair at the end of the day. Since we were younger I have noticed Emily's Trichotillomania. I didn't know that's what it was called but I just noticed her pulling her hair out, and then as she got older it became a bit more, like it happened every day, and definitely in the last couple of years it has become an issue. The family managed by coming together and working out ways that we could support her, just kind of reaffirming that it was going to be ok.